Snacking gets a bad rap, but it can actually help you maintain a healthy weight—and even lose weight—as long as you pay attention to the types of foods you snack on and make smart choices. Eating smaller meals and snacks about every three hours or so can help maintain more stable blood sugar levels throughout the day. And, it can help you avoid extreme hunger so you don’t overeat at lunch or dinner. If you find yourself heading for the fridge soon after snacking (or worse, the vending machine), you may be choosing the wrong kinds of food. Calorie-dense snacks that are high in fat or sugar—like candy bars and potato chips—may satisfy an immediate craving but tend to stave off hunger for only a short time. That’s because junk food passes through the digestive system quickly. A healthier way to snack is to choose foods that combine protein, fiber, and a small amount of heart-healthy fat, such as monounsaturated fat or omega-3 fatty acids, and not too much sugar or salt. These types of snacks are more likely to fill you up and keep you satisfied until your next meal. Nutrition experts suggest you should keep snacks to about 100 to 200 calories. It’s also important to get in the habit of reading Nutrition Facts panels to check the healthfulness of a snack. More important, snack mindfully. Savor what you’re eating and chew it slowly. Pay attention to the flavors and textures. It takes about 20 minutes for your brain to get the message that you’re full. Give yourself some time before reaching for another snack. Nuts are packed with protein and healthy fats, so they help you stay full longer. Enjoy a handful of almonds, pistachios, hazelnuts, macadamia nuts, or unsalted or lightly salted dry roasted nuts. To make your snack last longer, choose nuts that you have to un-shell one at a time. Or, toss walnuts into an individual serving of unsweetened applesauce. A cup of frozen grapes is an easy, nutritious snack. It’s a fun way to satisfy your sweet tooth with just a handful of calories. If grapes aren’t your thing, try a frozen banana drizzled with a tablespoon of chocolate syrup. Make a batch of creamy, smooth hummus at home and spread it on whole grain crackers or a six-inch whole wheat tortilla. Hummus also makes a savory dip for cut veggies. Oat bran is a complex carbohydrate, so it helps fill you up without spiking your blood sugar. A small bowl of oat bran flavored with low-fat milk, vanilla extract, and cinnamon makes a hearty, filling snack. Plus, blueberry oat bran muffins are the perfect afternoon pick-me-up. A single-serving container of light, low-fat yogurt (or Greek-style yogurt) is an easy snack when you’re on the go. Add fresh fruit, ground flaxseed, or reduced-fat granola to yogurt to pack an additional nutritional punch. Or, try freezing a container of whipped yogurt for something new. Try roasting them in the oven with olive oil, a pinch of salt, and a teaspoon of ground cumin. Roasted chickpeas have the crunchiness of chips but with a meaty texture and a nutty flavor. Nutrient-dense avocados are a powerful source of heart-healthy monounsaturated fat. Sprinkle avocado slices with sea salt or fill a halved avocado with salsa. As a whole grain that’s naturally high in fiber and low in fat, air-popped popcorn is a gluten-free snack with staying power. Drizzle melted bittersweet chocolate over popcorn for a decadent treat. For a portable, healthy snack, whip up a batch of trail mix with high-fiber cereal, nuts, and dried fruit. Dried fruit is packed with fiber, but be sure to look for fruit with no added sugar. Fresh fruit is always a healthy snack. 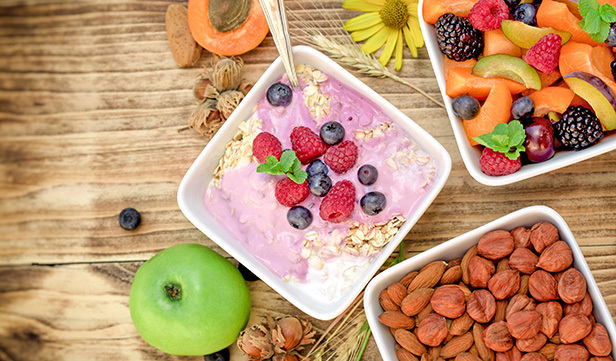 For a creative spin, pair a piece of fruit with a few nuts, low-fat cheese, cottage cheese, or some whole grain cereal and low-fat milk. Or, try a cup of berries with a tablespoon of melted chocolate chips for dipping. If you slip up, don’t worry. Healthy snacking is a habit you’ll develop over the long haul. Plus, it’s okay to give yourself little treats from time to time. Trying to be too good can set you up for failure. So, yes, go ahead and indulge yourself with a small piece of dark chocolate after dinner. Just don’t make it an everyday thing.